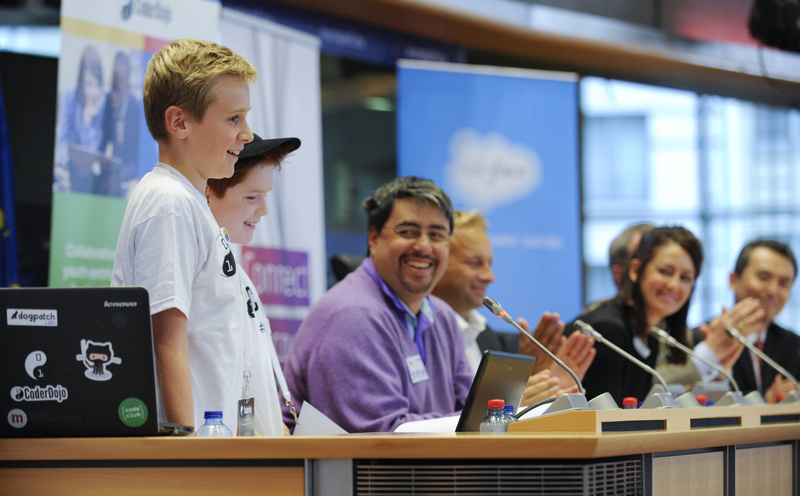 MEPs learn to code from CoderDojo youth at the #EUDojo! On October 14th, CoderDojo and Sean Kelly MEP hosted the second #EUDojo event, where 35 CoderDojo attendees from Dojos in Poland, Romania, Italy, the UK, Ireland, Belgium and the Netherlands taught MEPs to write their first line of code. 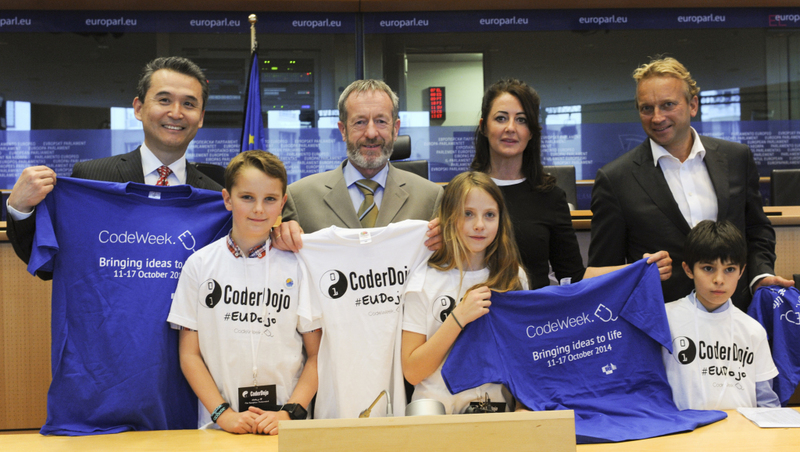 The special #EUDojo in the European Parliament brought together young coders, MEPs and industry leaders from across Europe to celebrate CodeWeek.EU. During the two hour ‘reverse Dojo’ CoderDojo youth Mentors showcased their technological ability by Mentoring MEPs to build websites using HTML. MEPs that learned to make their own websites at #EUDojo included: Eva Paunove (BG) Catherine Stihler (UK), Julie Ward (UK), Mairead McGuinness (IE), Lorenzo Malfattor (IT) Marian Harkin (IE),Brian Hayes (IE), Deirdre Clune (IE), Sean Kelly (IE), Matt Carthy (IE), Liadh Ni Riada (IE), Mircea Diaconu (RO), Bogdam Wenta (PO), Jaroslaw Walesa (PO) and Michal Boni (PO). Congratulations to the five of the young coders, Sam & Tom (UK), Thomas (IE), Giulia (IT) and Zuzanna (PL) that showcased projects that they have built with the skill learnt at their local Dojos! Sam & Tom, ages 9 & 12, attend the Wilmslow Dojo and have created a Scratch game for Dyslexic Children which helps them learn the alphabet in a visual way. Thomas is 15 years old and started going to CoderDojo DCU, Ireland in May 2012. Thomas showed the crowd a robot from the 1990s, he replaced the technology inside the robot with Arduino and a motion sensor. Giulia, Age 10, attends the CoderDojo Bologna, Italy and she loves making websites with HTML. Previously with Scratch, Giulia made a game which taught people how to separate waste in the best way for recycling. Zuzanna, Age 10, attends the Bialystok Dojo in Poland. She built a game titled ‘Polish my English’ which translated Polish words to English. At the end of the ‘reverse Dojo’ ,David Brett, age 12, from Blackrock Castle CIT CoderDojo, Cork demonstrated his fully finished website built especially for the event. CoderDojo Co-Founder Bill Liao and Sean Kelly MEP respectively opened and closed the proceedings. While speaking Bill Liao told the room how his vision is for CoderDojo to democratise code by bringing it to all the children in the world. 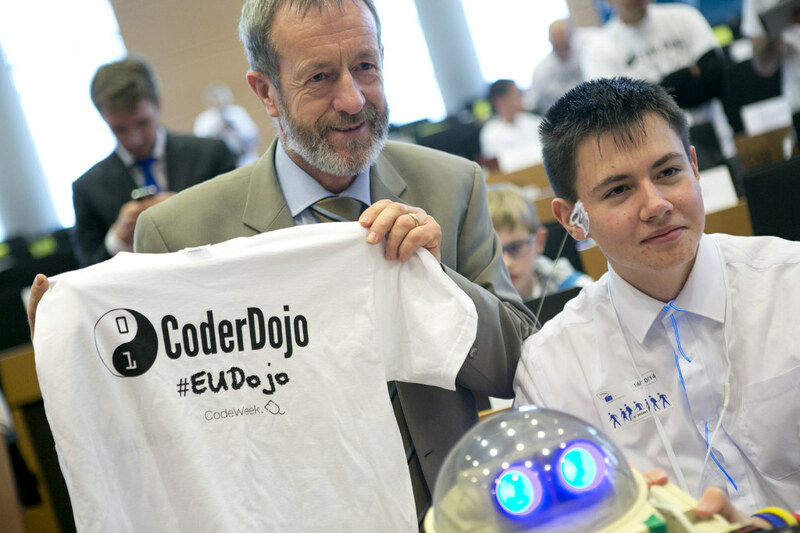 At the event Sean Kelly MEP took the opportunity to call on all MEPs in attendance to become ambassadors for CoderDojo by starting new Dojos in their constituencies by Code Week 2015. The chairman of Samsung Europe SW Kim told the room of young coders and MEPs how CoderDojo has been the inspiration influencing the Samsung: Coding Master Class Programme, which aims to promote digital literacy and programming to 50,000 kids in 1,000 schools around the world! 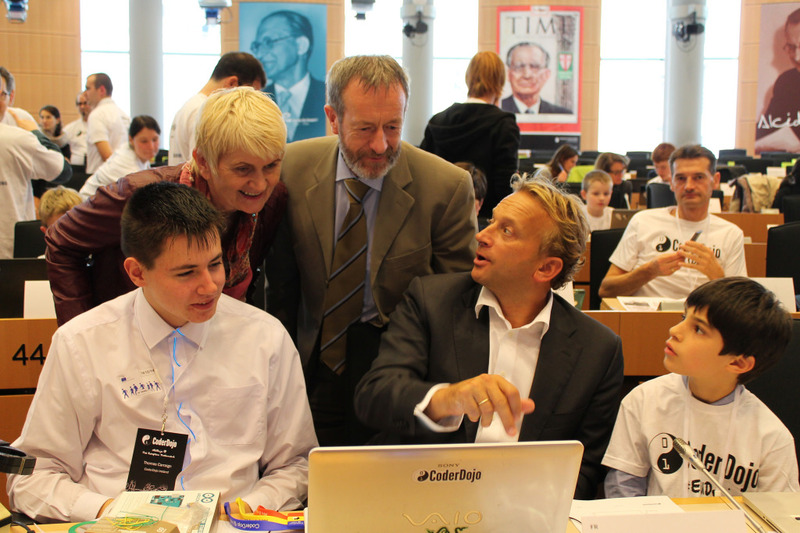 Marian Harkin MEP, Sean Kelly MEP and Manuel Kohnstamm (Liberty Global) are taught to code! Senior Vice President & Chief Policy Officer of Liberty Global, Manuel Kohnstamm, also commented on how inspirational the CoderDojo movement was and how he is proud of Liberty Globals support of CoderDojo in Ireland and Belgium. He also mentioned how Liberty Global is already working with the CoderDojo Foundation to scale CoderDojo through their networks to an additional 60 clubs this year. Manuel Kohnstamm also announced the launch of the new CoderDojo #powerfulplay communications campaign designed to support this plan by recruiting Mentors and Champions to start Dojos all across Europe. Thank you to #EUDojo host Sean Kelly MEP, all the youth Mentors that taught MEPs to code and the adult Mentors that organised the event. Also a big thank you to CoderDojo Foundation partners, Liberty Global and event sponsors Google, Salesforce Foundation and Samsung.